Hermosa Heights 28 - Cozy Villa with Ocean View in Beautiful Hermosa Heights! 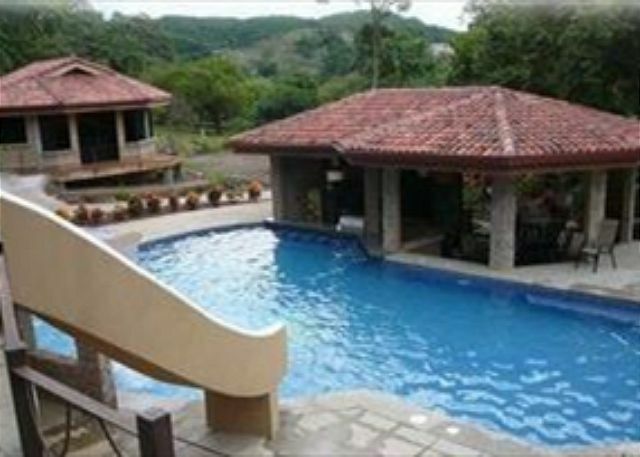 Hermosa Heights is a gated resort style community is centered in the heart of Playa Hermosa. Enjoy the cool ocean breeze from the deck. The ocean view from the deck. Hermosa Heights Community Pool has two slides. The community also has miniature golf, basketball, ping pong, and a small shopping center. Hermosa beach is great for swimming, sunbathing and walking. The Kitchen and Living are in the same room, which makes it easy for all to be together! Cozy sofas and decorated with local artwork. The Bar gives ekstra cooking space in the Kitchen for you to prepare wonderful meals. 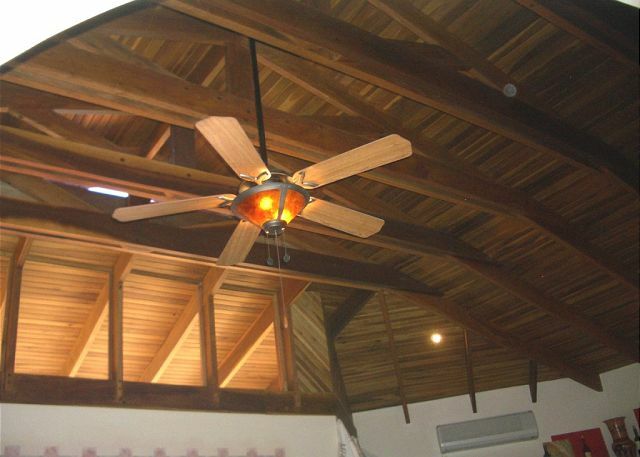 The exposed teak beam open ceilings characterize the house. 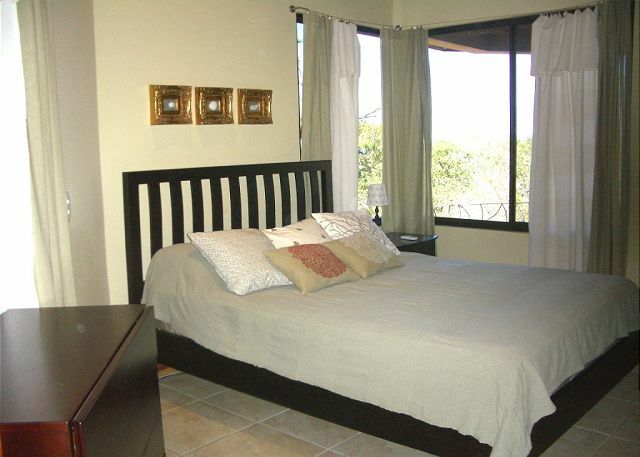 The Master Bedroom has a Queen-size bed and private Bathroom. 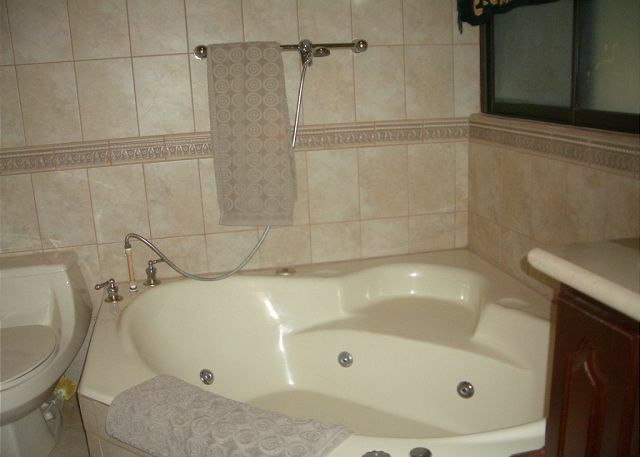 Relax in the big Jacuzzi in the Master Bathroom. The guest bedroom also have a Queen-size bed. 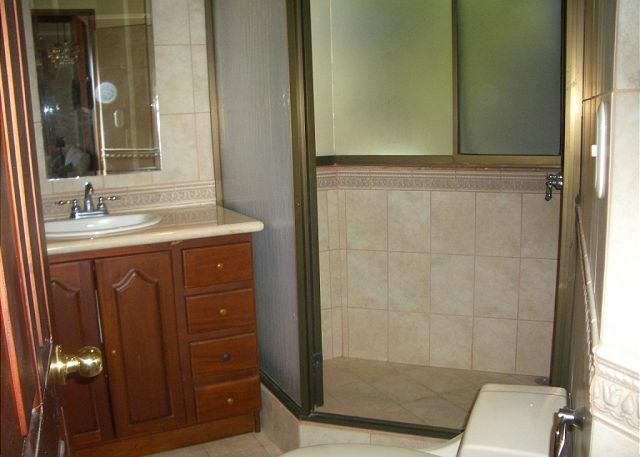 The guest bathroom has a large shower and toilet. 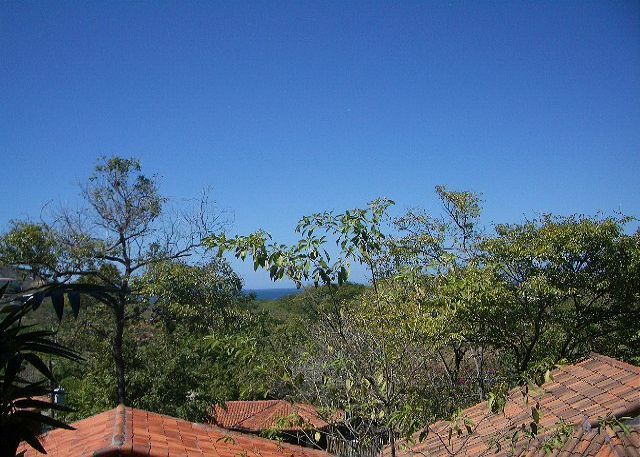 This charming casita has 2 bedrooms/2 baths and is located in Hermosa Heights, a quaint development in the heart of Playa Hermosa with large community pool, miniature golf, playground, movie theatre, ATM, and sports bar. 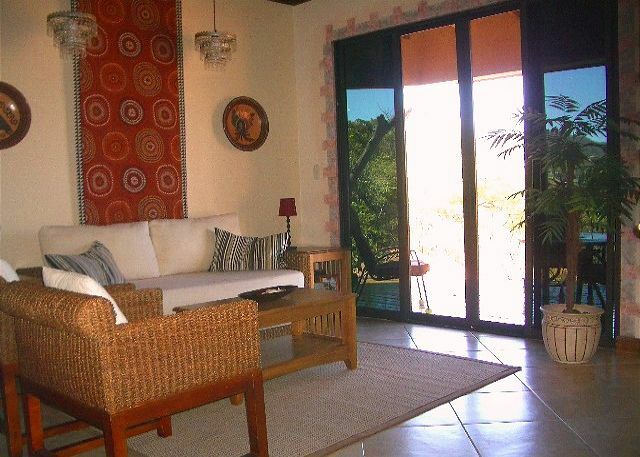 The casita is beautiful furnished and appointed with local art. 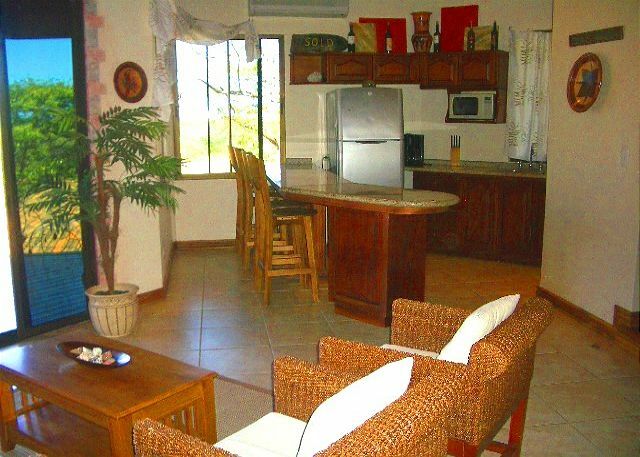 The open floor plan has a spacious living area and kitchen with eat in bar. 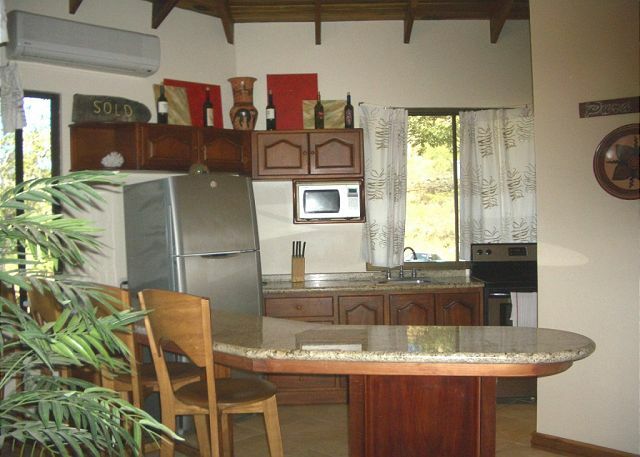 The kitchen is fully equipped for all your needs to cook a wonderful meal. The master bedroom has beautiful bedding, and an en-suite bath full outfitted with luxury towels and linens. 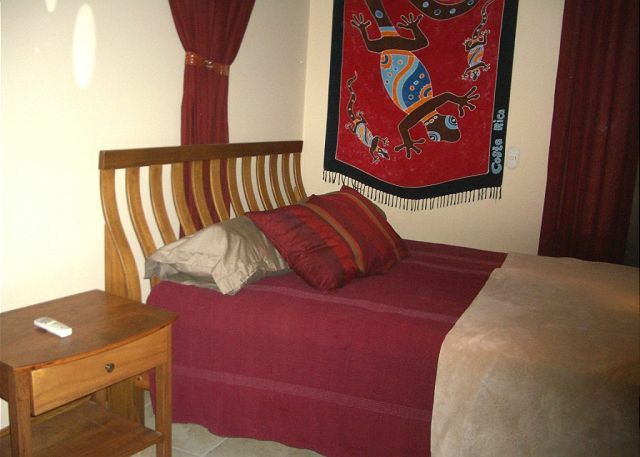 The second bedroom has a queen bed and is adjacent to the guest bathroom. 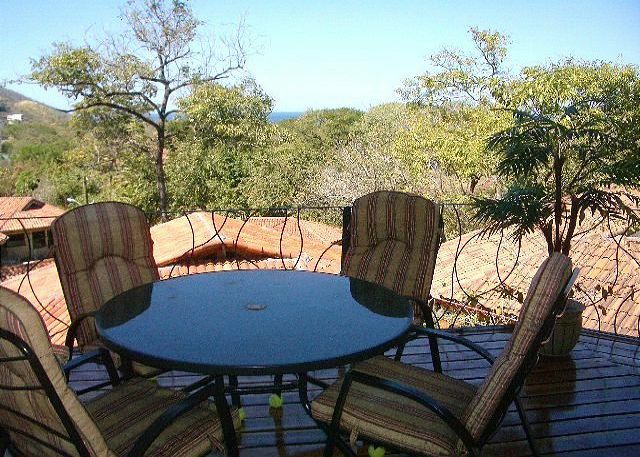 Enjoy the cool ocean breezes from the deck that affords an ocean view of the blue Pacific. Sit back and relax - Pura Vida! Overall we were very pleased with our stay at Hermosa Heights. The accomodations were very pleasant. The one thing that was lacking was the kitchen. There was a ageat lack of dishes, serving bowls and pots and pans. There was no kettle or blender both of which I missed. The Kitchen utensils and silverware were very sparce. The towels were very nice and in good shape and supply as was the bedding. The cleaning staff we great. The only outside amenites open was the pool and mini golf. It was low season so I suppose the was the cause. Overall my stay was very pleasant. the condo was very nice and the pool was good. 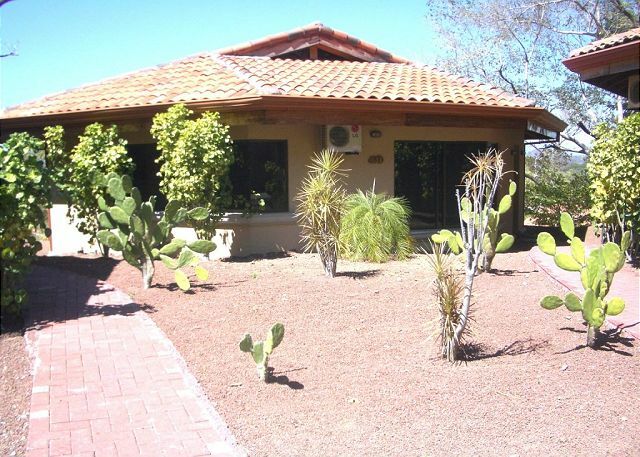 This experience was fantastic, with very helpful, hospitable, and friendly staff, a gorgeous place to call home for a week, and a million dollar view. I wouldn't hesitate to stay here again! EL lugar muy bonito, y mi familia y yo la pasamos muy bien. El trato de milagro management muy profesional, excelente servicio. Jodi S does not recommend this vacation rental. #28 Hermosa Heights was a very nice unit. Our first impressions were very high, and after a long day of trekking we enjoyed coming home. Given the above, a few negatives we must speak of, that will mean we would not return to Hermosa Heights. 1. The Hermosa Heights community was largely vacant - the pool was not cleaned very often, the mini-putt was not maintained. On paper a nice place for kids, but not in reality. 2. 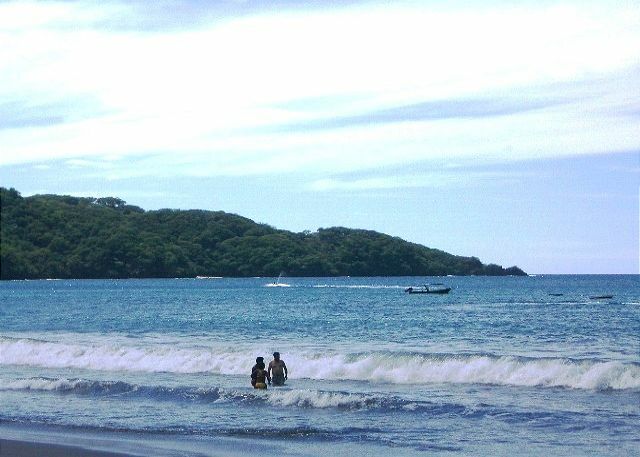 The area of Playa Hermosa, was dirty. Garbage is constantly left to rot on the roads in front of the communities road. Vultures hang out in gangs to eat the rot. 3. We had a hard time getting a cleaning done of the unit. We were told the unit was cleaned one day, but that was clearly not the case. I was on my knees cleaning the shower and bathtub so my kids could get cleaner, not dirtier. They sent out a cleaning woman immediately (thank you), and she cleaned it nicely. Overall the dirtiness and lack of sidewalks (ie. safe places to walk) prompted us to rent a car, so we could avoid what we didn't like. Laura, our contact at Milagro, was always ready to help by voice or email. She was outstanding - next time we may ask Milagro to help us find a different neighborhood to rent within. We really loved the people, and are not confused about the state of the dirtiness - likely a mixture of lack of public infrastructure to clean and cultural differences. We will return, but not to that area. The house is big enough for 4 people and has a huge terasse that we loved. Great rental. Unit 28 is the ideal location within the complex. The rental Staff as well as the Maintenance and Security people were all very helpful and wonderful to work with. Marvellous views of the Pacific and surrounding areas. Will definitely return. Connie N from Timmins, ON does not recommend this vacation rental. Despite the location and and quality of this rental, we would hesitate to recommend it to a friend for one reason: isolation. During our stay at Hermosa Heights, there were very few other "guests" using the adjacent casitas and the public areas of the development (pool, sports bar). This gave one the impression that they were somewhat isolated. This is our personal opinion only. I would go back to this location without hesitation. I had the trip of a lifetime. It was more than what I expected. A special thanks to Jeff at Milagro Management and Rentals for his quick response when I requested a BBQ to be added to the deck of my rental property. One phone call and it was done in a half hour. As I have told all of my friends, there was not one issue for my 28 day stay. See you next year.